Chaunie Marie Brusie--creator of TinyBlueLines.com and Catholic pro-life advocate for young mothers--draws on her own experience when she was an unmarried pregnant college student, offering those in similar situations the resources to thrive in education, career, faith life, and the journey of motherhood. 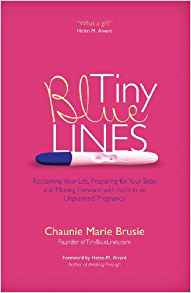 When Chaunie Marie Brusie stared down at the pregnancy test her senior year of college and saw two tiny blue lines--a positive test--she knew the road forward would be filled with difficult decisions, but she rose to the challenge. Brusie graduated from college, got married, and became a labor and delivery nurse and vocal advocate for the millions of young women who experience unplanned pregnancies each year. In her debut book, Tiny Blue Lines, Brusie offers coaching to young women, reminding them that their plight is near to the heart of Mary and that there is healing to be found in such Catholic practices as the Sacrament of Reconciliation. Brusie provides lists, resources, humor, anecdotes, and spiritual inspiration to help women gracefully navigate this challenging terrain.